The book "Found" is like walking through the scripture Psalm 23. It has pictures that go along with it as if we were the lamp and Jesus our Shepherd. This is a board book and is very short. 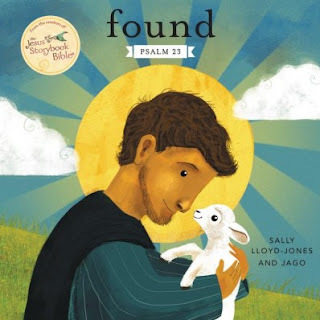 This is a Sally Lloyd-Jones book so it has one of my favorite lines from the Jesus Storybook Bible, "God's never stopping, never giving up, unbreaking, Always and forever love will go, too!" Sally uses that line in most of the stories in the Storybook Bible. Jesus is the center of it all... he is our answer! Pictures are calm and the scripture is a favored one among many.